Many organizations have a legal obligation to record the radio communications. You may also have a management related reason for recording the voice and data calls in the network. together with the speech or data communication. You may need to check which orders were given a few minutes ago. Your radio network may have hundreds of users in many different organisations. They all use their radios in round-the-clock shifts. What if an organization has to retrieve a certain conversation from among all this information? Many other vendors’ TETRA networks are limited. There, a conversation can only be retrieved within a large chunk of conversations and data. This can be a problem. The chunk might contain conversations that the retriever is not authorized to hear. Thankfully, TETRA networks from Airbus make it possible to retrieve the precise conversation. A conversation can be retrieved. However, it comes within a large chunk of conversations and data. The same as a librarian handed over a stack of books and told you to look through them for a certain sentence. 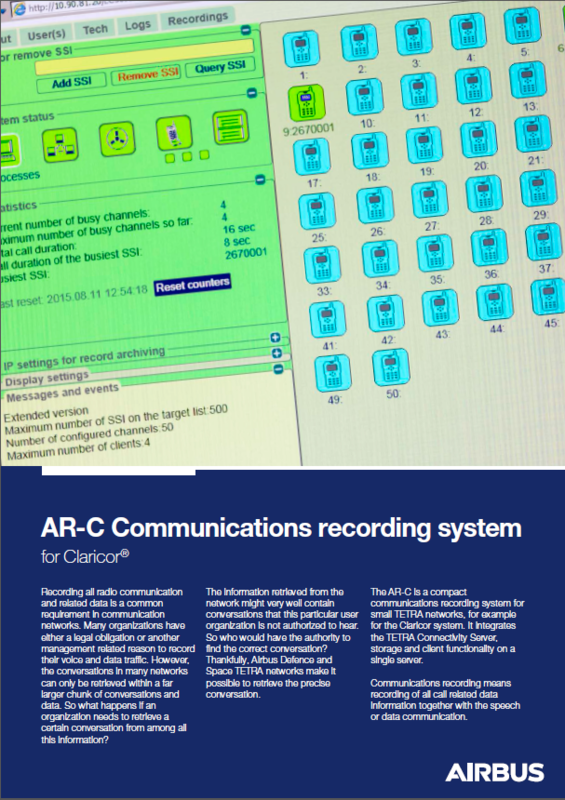 AR-C lets you retrieve the precise conversation. The same as a librarian opened the right book for you. Then pointed to the correct sentence on the correct page.